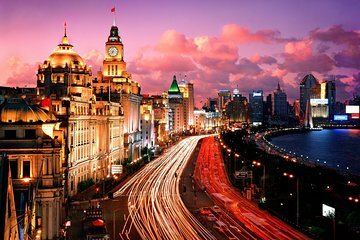 See the city of Shanghai light up at night on this private evening tour, which takes you to top attractions such as the French Concession and the Zig-Zag Bridge. Take in panoramic views of the city from the VIP deck of a cruise along the Hungpu River, and then choose to be dropped off back at your hotel or to continue your evening out on the town. Great tour. Tom was excellent! Informative, knowledgable and friendly. Site would not have been the same without his guidance. Must do! We completed our two week long China visit with this tour. We had several guides along the way and Tom, hands down, was the most knowledgeable and best spoken (in English) of them all. Though it was raining, we all still had a wonderful time. Tom was patient, kind, and he went beyond his duties. The tour itself is worth the time and money but Tom enhanced it tenfold. This tour was so well organized and it was such a smooth and enjoyable experience for me. Roy my private guide has given me a very good tour of Shanghai city with good stories on history, culture, people and many more. It was a pleasure chatting with with Roy while enjoying this tour. Just a delightful evening. An outstanding tour! Jimmy was great. We were only in Shanghai for one day, for a long layover and our tour guide Tom went above any beyond to make our day count! He was so patient and kind, we had a delay in our flight and he patiently waited at the hotel for us. He knew everything about China and answered all our questions. Highly recommend him and this tour especially if you are short on time. I had a few hours to spare in Shanghai during a work trip and wanted to see the city. Tom was a fantastic guide and was able to show me so much of the city in a packed 4 hours. He was really knowledgable and had some hidden gems up his sleeve, locations I'd never find myself. I highly recommend a tour with Tom! we wonted to see at night ! Thank you Tom! We really enjoyed this tour. Tom was an excellent and informative tour guide. Wonderful views of the night lights of Shanghai from the river cruise. We really enjoyed visiting Shanghai old town as well. All up, a really great experience. This is a must do tour as the night lights of Shanghai are beautiful. I highly recommend seeing Shanghai by day and night as the sites look so different all lit up. Our guide was Tom. He was knowledgeable and spoke perfect English.